People on a low carb diet often feel as if they need to give up certain foods like pizza, pancakes or waffles. With the right cooking and baking mix, though, you can enjoy delicious foods for breakfast, lunch and dinner without cheating on your diet. Even if you’re not on a diet, you can still enjoy amazing meals that are more nutritious. Trust us, your waistline and overall health will thank you. Hold the Carbs created a line of cooking and baking mixes that feature only a small amount of carbs, allowing people to enjoy meals that have been typically regarded as off-limits. This product offers taste and nutrition without the guilt often associated with eating heavy carbs. In addition, many of these dishes are made with Stevia, a natural sweetener. Hold the Carbs are a great way to make low carb and gluten free meals and treats that you will absolutely love. You might even be surprised by how much your friends, family and guests enjoy them. Let’s look at some of the Hold the Carb products that our customers swear by. Then, we’ll share some of the best recipes that are yummy and easy to make. This crust mix comes in either 300 g and 75 g, and it is incredibly easy to work with. This means that even novice pizza makers can have fun slinging dough. One 300 g package makes four 12” pizza crusts, and contains only 180 calories and 6 g of carbs per half pizza. To make a piping hot pizza, all you need is ¾ cup of the mix, 3 eggs or 5 egg whites and ¼ cup of water. You can add 1 tbsp. of olive oil to make the crust crispy. Once you have your dough ready, just add your favourite toppings and you’ll be good to go! One thing to note is that your topping of choice could increase the amount of carbs or calories or contain gluten. What’s better than a muffin with your morning coffee? They’re quick to make, eat and are travel-friendly. The issue is that they are heavy with carbs and can slow us down, which actually make them less than ideal for breakfast or as an afternoon snack. 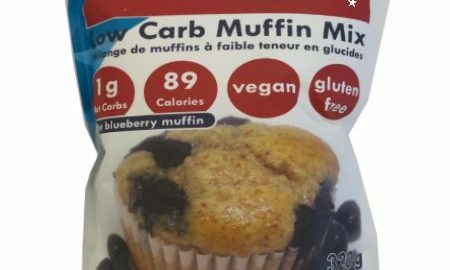 With Hold the Carbs Protein Muffin Mix, you can make low carb muffins that are fluffy and delicious. They are also vegan and gluten free. And as you might have guessed from the name, they’re rich in protein, containing 4 g.
You can choose between one with sucralose and one with Stevia. People without baking skills can make these muffins in a pinch. Simply combine one bag of mix with either 2 eggs or 3 egg whites (or a vegan substitute, of course) with ¼ cup of milk or almond milk. You can spruce up a muffin with any add-on. We love walnuts but you can try sugar-free chocolate chips, banana chips or cranberries. What’s better than waking up on a Sunday morning and enjoying a hot stack of pancakes or waffles covered in fresh fruit. If you want to keep low carb breakfast options in your pantry, than we recommend trying the Hold the Carbs Pancake and Waffle Mix. To get started, pull some mix out of the freezer, place it in the microwave and you’ll be enjoying a hearty yet low carb breakfast in no time. These will replace the flour-laden pancakes you usually feast on, and you won’t notice a difference in taste or consistency. Here are some of our favourite recipes. The idea is that you can replace ingredients with Hold the Carbs cooking and baking mix unless otherwise stated. From the Hold the Carbs website, this low carb muffin recipe is to die for. It’s for chocolate chip muffins but feel free to replace with blueberries or to include nuts or something fun like apples and a sprinkle of cinnamon. You only need one cup of their Low Carb or Protein Mix to make a batch of six muffins. All you must do is choose a mix and add ½ tsp of baking cocoa. After the mix has baked for two minutes add 2 tsp of semi-sweet chocolate chips. Be sure to only use semi-sweet chocolate as sweet or regular chocolate chips will make it far too sweet. You might be thinking that pumpkin flavoured anything is only appropriate during the fall. We disagree! Pumpkin is so delightful and delicious that you should enjoy it year round. To enjoy a pumpkin muffin recipe, that is low carb, again add 2 eggs or 3 egg whites to the mix along with ½ can of pumpkin puree and 1 tbsp of pumpkin spice. Just because you are committed to a low carb lifestyle, doesn’t mean you can’t have a breakfast sandwich packed with salty pork and gooey cheese with a touch of maple syrup for sticky sweetness. This recipe lets you enjoy Hold the Carbs pancakes one morning and then turn the leftovers into a succulent sandwich the next day. All you must do is fry an egg and break the yolk. Cook it to preferred doneness. In a separate pan, warm 1-2 slices of ham. Throw the leftover pancakes in the toaster and then place them on a plate for when you are ready to assemble. Pour 1 tsp. of syrup over the eggs and place a slice of cheese on top to melt it. All that’s left is assembly. Place the cheesy egg on top of the pancake. Then, add the ham on top and finish with another pancake. Even just thinking about this recipe can make you hungry. A nice touch is to whip up a quick garlic aioli or spicy ketchup for dipping. Hold the Carbs gives you amazing low carb dough to make crispy and satisfying pizza each and every time. When it comes to pizza, it comes down to your personal tastes and your imagination. If you’re looking for a recommendation for a unique pizza, then we’ve got you covered. Grilled Honey Sriracha Chicken Pizza will become your new favourite, so much so that you’ll stop ordering from your favourite local joint. All you need to do is swap in Hold the Carbs Pizza Crust Mix and grill it for 2-3 minutes on each side. In a small mixing bowl, combine honey, soy sauce, orange marmalade, lime juice and 2 tbsp. of Sriracha. Cook on the stovetop until it boils and then reduce heat. It will thicken as it simmers for 5 minutes. Toss the chicken inside the sauce. Next, spoon some tomato sauce on the dough—we recommend using Walden Farms Tomato Basil. Top with manchego cheese, the chicken mixture and mozzarella. Grill on low to medium heat for 5-8 minutes (make sure the cheese is melted), remove from the grill, cut into slices and enjoy! If you’re on a low carb diet or looking for an amazing gluten free cooking and baking mix, then we urge you to try Hold the Carbs. It’s easy to use and helps make delicious food and baked goods every time. We hope you try these recipes out for yourself and for your friends and family. Be sure to shop our selection for your recipe ingredients and to discover many delicious and healthy low carb products.